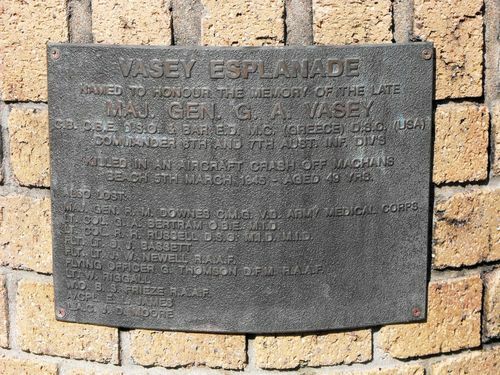 A plaque commemorates the naming of Vasey Esplanade in honour of Major General George A. Vasey who was killed in an aircraft crash off Machans Beach in 1945 . The plaque is also dedicated to the other victims of the crash. The plaque is attached to the Marlin Coast World War Two Memorial. George Alan Vasey CB, CBE, DSO and Bar (29 March 1895 – 5 March 1945) was an Australian soldier. He rose to the rank of Major General during the Second World War, before being killed in a plane crash near Cairns in 1945. The aircraft Vasey was travelling in, RAAF Lockheed Hudson A16-118, took off from RAAF Station Archerfield on the afternoon of 5 March 1945. Due to a cyclone that was ravaging the Queensland coast at the time, the aircraft crashed into the sea about 400 metres out from Machans Beach, just north of the mouth of the Barron River, 2 kilometres short of the Cairns Airport. Vasey was killed in the crash along with all those on board. KILLED IN AN AIRCRAFT CRASH OFF MACHANS BEACH 5TH MARCH 1945 - AGED 49 YRS. Lt Col. R.H.Russell D.S.O.M.I.D. M.I.D. Flt. Lt. J. W. Newell R.A.A.F. Flying Officer G.Thomson D.F.M. R.A.A.F.